Crystal Bloom is absolutely amazing! The centerpieces were stunning for my special day. If you want to WOW people then go with Crystal Bloom. ~Michelle B. Thank you so much for the STUNNING centerpieces! But most of all you are such an AMAZING person to work with! My grandma described the crystal details as “foofaraw” done right! ~Tracy S.
Thank you so making our special day SPARKLE!!! 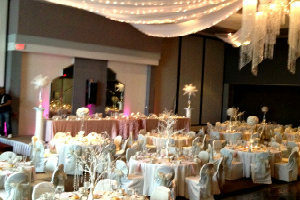 We rented centerpieces; my table had a huge feather centerpiece and then for the guest tables we had candelabras, crystal candle holders, and huge vases with big brooch centerpieces on top with lights. Everything looked amazing and people were in awe of all the sparkle. They did an amazing job; they are very professional and care about their business. Look them up on Facebook they have amazing stuff and great prices! ~Tiffany F.
Words cannot express how you wonderful you were to work with. You are amazing…so kind, professional, extremely friendly and accommodating. The best thing I could have ever done was found your website and ordered centerpieces from you. They were absolutely breathtaking! Your centerpieces made my parents 50th Anniversary celebration so elegant and beautiful. Thank you from the bottom of my heart for everything! All the best, Teresa B. Where to even begin…You were absolutely wonderful to work with. The centerpieces were STUNNING 🙂 I am so thankful I found you because my wedding would have not been half as beautiful without your services. I will BRAG to everyone about you. ~Justine H.